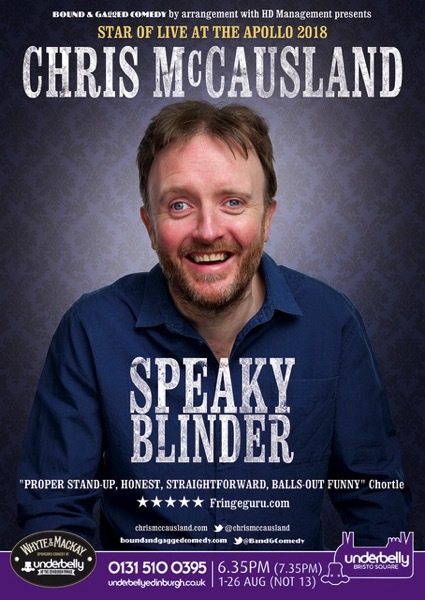 That blind comedian - Chris McCausland | Stand-up comedian, and other things. Stand-up comedian, and other things. I will be doing a tour next year in May/June. Click for dates and tickets!  Recommended by The Sunday Times – Best of the Edinburgh Fringe 2018! Thomas Edwards – @tedwards2412: Amazing show by @chrismccausland at #edfringe2018. Favourite of the festival! annalisa d’innella – @adinnella2: Saw @chrismccausland last night at @FollowTheCow. My face was hurting from smiling and laughing non stop for an hour. He’s warm, truthful, funny and a bit daft. Perfect show. My festival highlight. Five stars.